For over 120 years, the Des Moines firm of Brooks Borg Skiles Architecture Engineering LLP and predecessor firms has held a significant role designing the architecture of Iowa. Qualities that unify this body of work are long term client service, durability, and mainstream stylistic expression. Prior to 1895 when the founders, Proudfoot and Bird, began their Iowa practice, they collaborated in partnership in Wichita Kansas and Salt Lake City Utah designing over 70 commissions including college, business, and residential buildings. 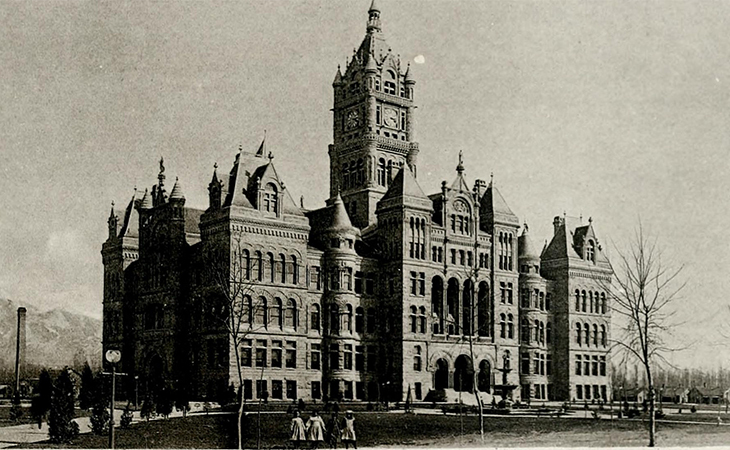 The City County Building in Salt Lake City is an extant landmark predecessor to the Polk County Courthouse, designed over a decade later in Des Moines. By 1900 Proudfoot and Bird emerged on the Iowa architecture scene by winning successful design competitions for Marston Hall at Iowa State University, Schaeffer Hall at The University of Iowa and Lang Hall at UNI. Their designs met with such approval that the firm became and continued for 30 years as the permanent architect for the Board of Education, the predecessor to the Iowa Board of Regents. The original three buildings and nearly 50 in total remain in use on the three campuses. The Classical Revival style and Indiana limestone exteriors characterize early many of the early 1900s university buildings and five extant Iowa county courthouses (Dallas, Polk, Jasper, Greene, and Pocahontas). Integrated and thematic public art or incised names or phrases related to the building function often appear on facades. As popular architectural styles evolved from period revivals to mid-twentieth century modern, the firm’s mainstream design philosophy is exemplified in Des Moines by the late gothic revival influenced Equitable Building, Lincoln and Roosevelt High Schools, art deco Iowa Des Moines National (U.S. Bank), and modern Solar Aircraft (CDS Global) and Merrill Middle School. The mainstream expression continues to the present with contemporary designs for ISU Hoover Hall, and the most recent office building addition to the EMC corporate campus, now under construction. Steve Stimmel, AIA, is partner at Brooks Borg Skiles Architecture Engineering in Des Moines and long-time walking tour guide and volunteer of the Iowa Architectural Foundation.